As you prepare to buy or sell your home in 2019, it’s important to know what to expect in the current housing market. 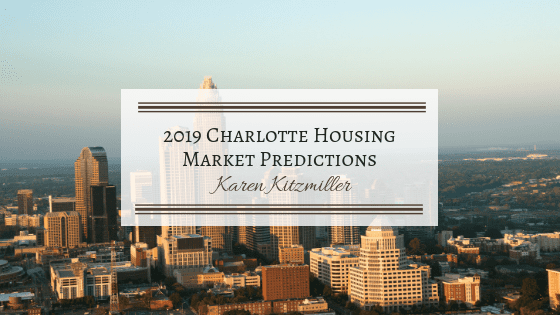 Below, I lay out my predictions for the Charlotte housing market in 2019. On paper, the Charlotte housing market is still a seller’s market. However, in reality, the market is cooling off, or slowing down a bit. Some of this is due to seasonal changes – winter is always slower – but rising interest rates have impacted the market. Interest rates increased steadily in the second half of 2018, which affects affordability for buyers. Combine the (1) rising interest rate environment with (2) the fact that the national household income saw a year-over-year increase of just 1.8%, and (3) home prices (nationally) increasing by 5.5%, and you have housing that is increasingly unaffordable for some buyers, which can be frustrating. The choice becomes to just stay out of the market. In the Charlotte area, specifically, we have seen an increase in median sales price of 5.8% over 2017. We also saw just under 6% fewer homes listed for sale in 2018 vs. 2017, but home sales were down just 1.9%. So that means the inventory crunch is still alive and well (Charlotte Regional Realtor Association). These numbers… low inventory… higher interest rates… increased median prices… affordability… what does this all translate to? I wish I could say that we would see inventory come back to more balanced levels (a “balanced” market is 6 months of inventory). However, I believe inventory will continue to remain low, as we have so many people locating to our beautiful area. In general, we will see Days on Market (DOM) increase from where it’s been in recent years. We will see fewer multiple offer situations, and we will continue to see the homes that are staged and presented perfectly sell the fastest, and for the most money! We also will continue to see different pockets of the market grow faster than others. Who doesn’t love indulging in a House Hunters or Fixer Upper marathon every once in a while? While these shows may be fun to watch, they tend to skew the expectations of home buyers. They portray home-buying to be an extremely simple, quick, and straight-forward process. While I always aim to take the stress out of the home search for you, the process is not without thorough research, financial consideration, and negotiation. As a result of the “HGTV Effect,” buyers may also expect their new home to come exactly as they imagined their dream home to be. Chances are, it won’t happen that way. If you’re buying a house, it’s likely you’ll have to make some adjustments or renovations to create a home that truly feels like YOURS. This “HGTV Effect” has impacted our market. Buyers are holding out for that perfect “HGTV” home, which could drive some multiple offer situations; this can lead to inflated home prices. Wait.. didn’t I just say we may see an increase in multiple offers? To clarify, they will still happen in some areas and price points for those homes that reflect that “HGTV” feel. However, as an overall market, we will see a decrease in multiples in 2019. In 2018, 44% of my listings experienced multiple offers. I had one seller with 15 offers! However, according to Magnify Money, in the second quarter of 2018, “banks originated just $820 billion in new mortgages, which is $20 billion lower than it was at the same point in 2017.” This is a good indicator that the number of people applying for mortgages will continue to decline, resulting in fewer multiple-offer situations in 2019. Now, the sky is certainly not falling. The Charlotte area is still booming, and people are still flocking to the Carolinas. You just may not have the burden of sifting through as many offers! As the housing market shifts, I often see people pricing their houses based ONLY on history, instead of pricing according to where the market is headed. This is a big mistake, as it will cause more issues in the future, when the house is appraised. To avoid the hassle of disputing your home appraisal, I recommend considering the current state, and the expected future state, of the market when you price your home. If you’re unsure, ask your real estate agent for guidance. According to the US Census Bureau, Fort Mill, SC and Indian Land, SC have been growing rapidly since 2010. These South Carolina communities are extremely appealing, as they lack the chaos of a big city, they offer lower taxes, and they are only a short drive away from Charlotte’s jobs, shopping and other amenities. Lancaster County, home to Indian Land, has grown by 21% since 2010. With even more dramatic growth, Fort Mill has grown by more than 62% since 2010. I predict continued growth in these areas, with Indian Land, in particular, on the rise. While many of these predictions may seem a bit “doom and gloom,” I assure you they’re not. I believe we are in a slight correction, but overall our market will stay relatively stable throughout the year. Ebbs and flows in real estate are completely expected. As long as you stay aware of current trends, and you have an experienced, knowledgeable broker on your side, you will be able to buy or sell your home successfully. If you’d like to work together to buy or sell a home, I’d love to chat! Please contact me here.